24 January 2019: Total Eclipse of the heart - or a Cross to bare? It’s time to say goodbye to our Mitsubishi Eclipse. The latest crossover from the Japanese carmaker has been with us for more than six months, and during that time we’ve been able to put it through its paces. We’ve taken it on the school run and the weekly shop, the daily commute, family holidays and everything in between. Which means we can tell you exactly what it’s like to live with so you can decide whether or not it’s right for you. 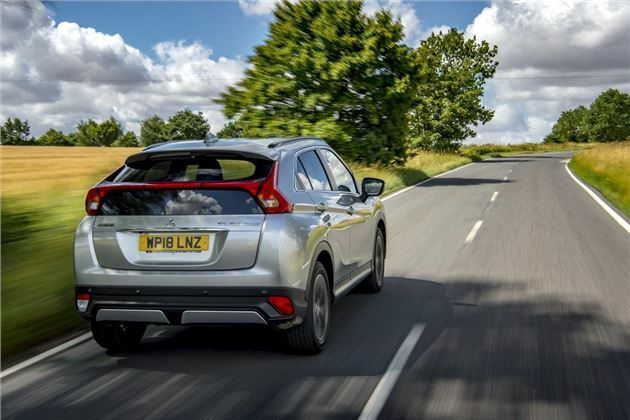 The styling is much improved over Mitsubishi’s previous efforts – a bold but costly move because while it might stand out on the motorway the design takes a huge chunk out of rear seat headroom and bootspace. True, there’s plenty of leg space room for rear seat passengers with the bench slid all the way back – but this takes us to one of our major criticisms – bootspace. In short, it’s tiny. And no we don’t know what they’ve done with it either. So if you need to lug stuff around, this probably isn’t the car for you. And the whole moving things schtick isn’t helped by the fact that there’s currently no diesel in the range. Not that the petrol isn’t capable – we were impressed by how peppy it was (once the turbo kicked in) but less impressed with the fuel consumption. We never got anywhere near the official figure. Or even over 40mpg, with real world driving bringing up mainly a figure in the low-30s. Stylish design restricts boot space; load floor isn't flat, either. Fine if you’re not a high-mileage driver, but as we normally do 12k a year, it hurt us financially. Which is a shame because in many ways the car is good value for money. Our £23k car gets head-up display, parking sensors, heated front seats, keyless entry… pretty much everything apart from 360-degree parking camera and the uprated stereo (which is personally is an option I think it would benefit from). All cars get the no navigation option as standard, which means you can use Waze (it’s free, and very good). And all cars get the touchpad. Which we’ve never warmed to – it doesn’t do anything you can’t do by just pressing a button and the extra layer of complexity requires a lot of looking down. Don’t think this is a high-tech all-new platform, however. The driving experience is very old school – from the high-up seats to the chunky switchgear. Some will find it familiar, others will wonder why it hasn’t been updated. So is this a car we’d recommend? Sadly not. It only really makes sense if you’re a loyal Mitsubishi customer and fancy swapping your current model for something a bit more modern (and you don’t have many miles to do). It’s a car that’s roundly beaten by the competition. Eclipse goes away. Shogun arrives. We know which one we'd keep..
20 September 2018: Who would buy a petrol Mitsubishi Eclipse Cross? 6 September 2018: What's wrong with the Mitsubishi Eclipse Cross? Keith hands the keys to his Mitsubishi Eclipse Cross to Andrew. How does it compare to the SEAT Ateca, Kia Sportage and Nissan Qashqai? 23 August 2018: A victory of style over substance? It's bold design has been lauded by critics, but at what cost? 26 July 2018: Is the Mitsubishi Eclipse Cross better than its rivals? 28 June 2018: Will there be a diesel version of the Mitsubishi Eclipse Cross?